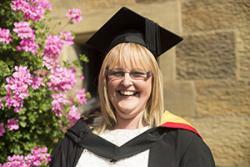 Through hard work and determination, a mother of four will be graduating this week in BA Health and Social Care. Beverly Price, from Amlwch, gave up work to raise four children, one which has mild autism and another with visual impairments. She enrolled on a course at Coleg Menai, and her tutors encouraged her to think about studying for a degree at Bangor University. Beverly, 38, said: “When my youngest child began school full time, I thought it was time to go back into education. I wanted to show my children that it’s never too late to learn. This is when my six year journey began. “Bangor was close to home meaning I could balance family and university life far easier. But being a full time mother, carer and wife with all four children having hobbies at a national level, it was sometimes a lot to handle! To add to her struggles, Beverly found the work very challenging at times due to her dyslexia. Beverly will be taking a year away from studying in order to save up enough money to do a Master’s degree.